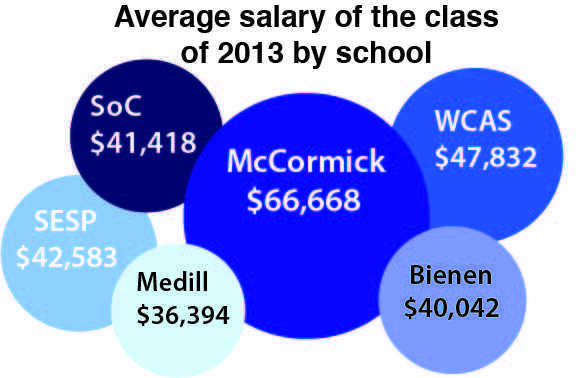 A recent study by University Career Services found the average salary of members of the class of 2013 that had full-time employment was $49,573. According to the study, 59 percent of the class was employed six months after graduation. Four out of five members of Northwestern’s class of 2013 were either employed or continuing their education six months after graduating, according to a new study from University Career Services. More than 1,000 students from the class of 2013 responded to the survey that was sent out in November. According to the survey, 59 percent of the class has a full-time job and 22 percent of the class is pursuing graduate or professional school. Only four percent of the class is still actively job searching. The study also found the two most popular industries for graduates were consulting, and communications, marketing and media, with 16 percent of the students who responded having full-time jobs in each of these fields. Business services, financial services and investment banking was the next most represented industry with 15 percent of respondents. The study also looked at average salaries by school and students’ experience with experiential learning and co-curricular involvement while on campus. The average salary for those with full-time employment was nearly $50,000 per year. In the past, career services gathered this data from seniors before they graduated. However, Mark Presnell, executive director of career services, said collecting information in June was too early. He said the timing for jobs varies based on the industry. Presnell said the study supports the conclusion that students are successful after graduating from NU. He said this is particularly important for the class of 2014, as they are set to graduate this weekend.